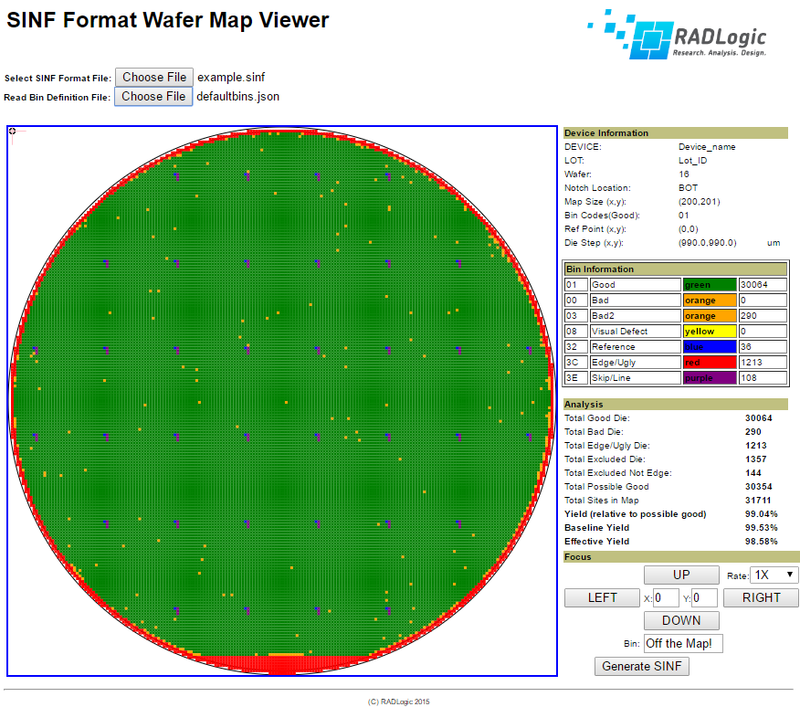 Have you ever needed to look at a wafer map to help analyse yield or process issues? If so, you may find this tool useful. Try it here if you have a SINF file to view. You can download an example SINF format file to try if you don’t have one immediately available. The bins (Good, Bad, Unused, etc) can be customised to your requirements by loading a Bin Specification File. Details of the format are given below, and an example bin spec can be downloaded for editing. The SINF Format Wafer Viewer can read a SINF format file without first loading a Bin Specification, because it automatically adds new bins to its list if it comes across ones it does not know about. However, since the SINF file itself does not contain any specification of what the bins are used for (and unknown bins are considered as bad devices), the Bin Specification file is used to specify the parameters of each bin you wish to use. If you don’t know what bins are used in your SINF file, it can be convenient to first read the SINF file without first loading a bin description file (to identify which bins are present), and then create/edit your bin specification file to assign the bins to suit your preferences. The bin Specification file is actually a simple JSON object description. name String The name of the bin. code String The coresponding two character code found in the SINF file. colour String The colour to display for this bin. isgood Boolean If true, count this die type as a good die for yield calculations. excluded Boolean If true, do not consider this die site in yield calculations (it is neither good, nor bad: just unused. The bin numbers (code) for each entry need to be unique, but the bin name and/or colour can be the same across several entries.